Micro Abrasive Blasting Units, or Micro Blasters, are very easy to use. The handpiece and nozzle have been designed to give the user flexibility and control. 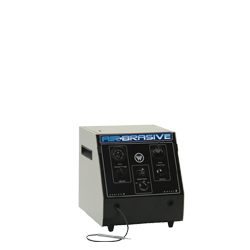 As a result, the Airbrasive® machine can be used to create precise cuts or intricate patterns on various metals, glass or plastic, whether on the surface of the object or in the hard to reach places that other tools are not flexible enough to reach. 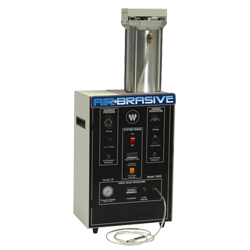 Abrasive also offers Airbrasive® Work Chambers which can be used with these units. 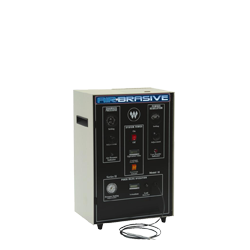 The chambers are also referred to as an abrasive blast cabinet, have been specially designed to assist in hand-held work. 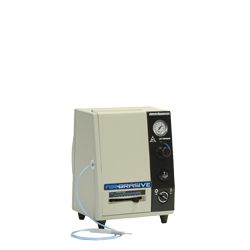 The model 6500 is an innovative, all-pneumatic microblasting machine. This unit was designed with portability in mind and for ease in field user. Our Model K is one of the most popular in the product line. It is ideal for lab use or pilot production research. Our Model H unit gives high volume producers the ability to micro-blast parts on production lines or in labs. With its 20 lb powder capacity, the Model HME (micro sandblaster) has the ability to micro sand blast on a non-stop, round the clock basis.